"Miles is a writer so virtuosic that readers will feel themselves becoming better, more observant people from reading him." Rendered paraplegic after a traumatic event four years ago, Cameron Harris has been living his new existence alongside his sister, Tanya, in their battered Biloxi, Mississippi neighborhood where only half the houses made it through Katrina. One stiflingly hot August afternoon, as Cameron sits waiting for Tanya during their daily run to the Biz-E-Bee convenience store, he suddenly and inexplicably rises up and out of his wheelchair. In the aftermath of this “miracle,” Cameron finds himself a celebrity at the center of a contentious debate about what’s taken place. And when scientists, journalists, and a Vatican investigator start digging, Cameron’s deepest secrets—the key to his injury, to his identity, and, in some eyes, to the nature of his recovery—become increasingly endangered. Was Cameron’s recovery a genuine miracle, or a medical breakthrough? And, finding himself transformed into a symbol, how can he hope to retain his humanity? Brilliantly written as closely observed journalistic reportage and filtered through a wide lens that encompasses the vibrant characters affected by Cameron’s story, Anatomy of a Miracle will be read, championed, and celebrated as a powerful story of our time, and the work of a true literary master. JONATHAN MILES is the author of the novels Dear American Airlines and Want Not, both New York Times Notable Books. He is a former columnist for the New York Times, has served as a Contributing Editor to magazines ranging from Details to Field & Stream, and his journalism has been frequently anthologized in Best American Sports Writing and Best American Crime Writing. He is also the author of a book on fish and game cookery, The Wild Chef, and competed in the Dakar Rally, an off-road race through Africa. "Jonathan Miles's masterful new novel Anatomy of a Miracle documents the slo-mo explosion of an attention-grabbing event with trompe l'oeil flourishes...Miles is a writer so virtuosic that readers will feel themselves becoming better, more observant people from reading him... Part of why Anatomy feels so expansive is that Miles takes every opportunity to delve into the characters' backstories... but this keen interest in people is part and parcel of a book in which the author describes humans as 'extraordinary' at least three times. In Miles's world, everyone — not just the people shouting loudest on the internet — is worthy of attention." 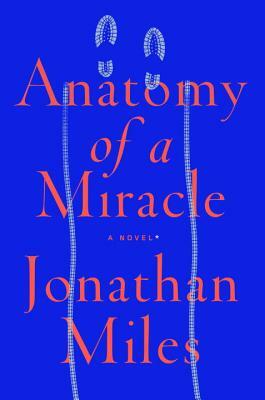 "The impossible happens in... Jonathan Miles's latest novel, Anatomy of a Miracle. But it's what occurs before the astonishing event and what unspools after that will break open hearts and imaginations... Miles's powerful prose nudges readers to seek the soft spots between faith and judgment, story and science, and fact and fiction." "Anatomy of a Miracle by Jonathan Miles is a novel that reads like a true story. It's about a US veteran whose paralysis from the War in Afghanistan is miraculously cured. Cue a media frenzy and you finishing this story in days." "Vibrant, bustling, and humorous... Cleverly shaped as a journalistic report, and told in a style similar to that of John Jeremiah Sullivan and Ron Currie, Miles' tale offers a nuanced and endlessly entertaining exploration of the age-old debate between faith and reason." “This is writing that pulls no punches...There’s a satirist’s edge to [it], an over-the-top sensibility reminiscent of Tibor Fischer and John Kennedy Toole. Satire, to be sure, is part of the point, but Miles is after something bigger—a story of reconciliation, of redemption, of a character trying to become unstuck.